With miles of ocean bordering the city, and some ocean side neighborhoods, the options for Dana Point ocean side of PCH homes are limited but great. Dana Point not only offer ocean view homes, but also some that are right on the sand with the homes on the 'Beach Road' in Capistrano Beach. Dana Point has many bluffs all over the city, giving many homes the altitudes needed for spectacular ocean and Catalina Island views. The geography of the city also helps, as there are also many canyons with homes scalloped around them, giving them a combination of a ocean and canyon view. Neighborhoods in Monarch Beach like Ritz Cove, Monarch Bay, Niguel Shores, the Strand at Headlands and some within the Lantern Village, are the ones to look for when searching for homes that are on the Ocean Side of PCH and offer walking distance to the beaches in Dana Point. These homes are going to be on the higher end due to location. This section was created specifically for any Dana Point ocean side of PCH homes and condos, regardless of the areas and neighborhoods they are located. Read more about the Dana Point Ocean Side Real Estate options below, and for any questions regarding any of these ocean view homes and their location, contact us via email or by phone at (949) 888-6788. The ocean side of PCH neighborhoods and options for real estate in this location are very limited. Starting our list at the top of the price range, there's the Strand at Headlands newer gated neighborhood, with homes strategically located to provide gorgeous views of the beach in front of them: the Strands. These homes also get gorgeous Catalina Island Views. The double gated Ritz Cove in Monarch Beach is another example of luxury ocean view real estate. These homes have views of Salt Creek Beach and coastline views. Niguel Shores also has some options for ocean side real estate, and also gives it residents a park located atop it's neighborhood bluff, with endless panoramic views of the Pacific Ocean. The Beach Road neighborhood in Capo Beach sits, as the name suggests, on the beach front. Coastlines views in both directions are exceptional from these homes. 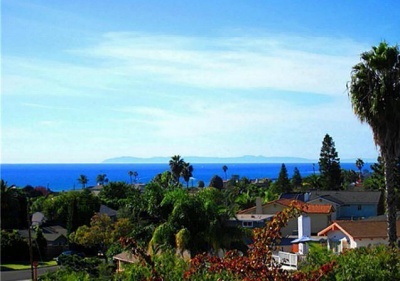 Capistrano Beach also has the many homes located atop the bluff, and many offer great ocean views. Lastly but not least, there's the many options in the Lantern Village, where one can find everything from a multi-unit, or a studio home or cottage, very reasonably priced, offering spectacular ocean views. The Lantern Village might be the best 'bang for the buck', when looking for Dana Point Ocean Side Real Estate. OCExecutives specializes in real estate transactions of Ocean View Homes in Dana Point, California. Contact us today to sell real estate or buy real estate in the ocean view communities of Dana Point or for more information about any of these ocean view homes. If you would like to see a list of ocean view homes in other communities in Orange County, follow the links above, or click here for other Dana Point Real Estate.